Aileen, Cindie and Mairi would like to wish you all the compliments of the season. We have appreciated so much support from our friends and customers as well as from our artists and suppliers. We’ve had a busy December thanks to you all. 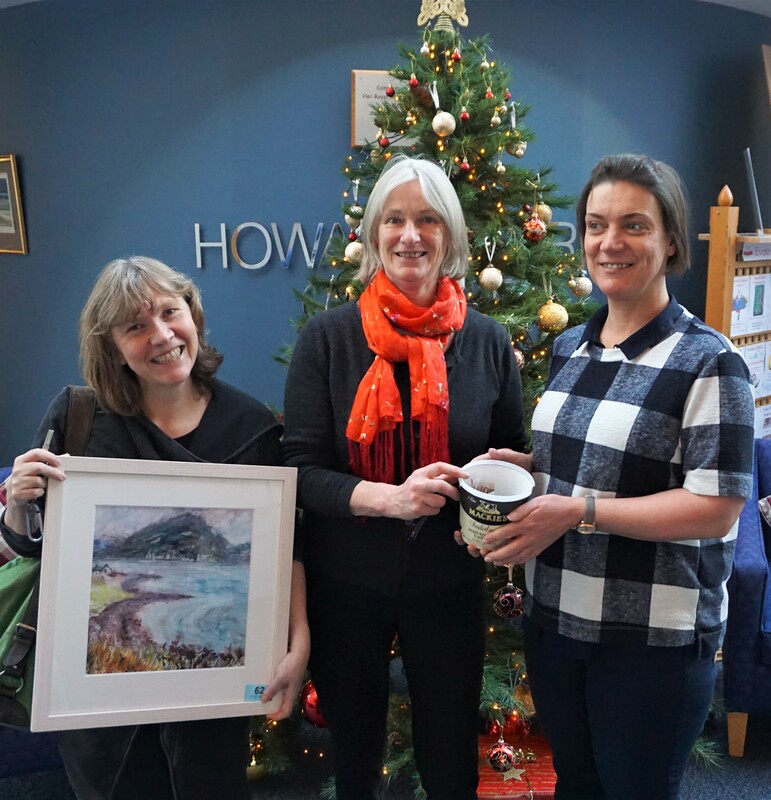 Our two Xmas Shopping weekends have been busy and we had a wee raffle which managed to raise £114 for the Howard Doris Centre in Lochcarron. Thank you. And, of course, we’ve kept things going despite the tricky snowy conditions up here in December! Our current exhibition of small paintings will stay up for the rest of December and into January – very affordable art. We are open on Friday 22nd and Friday/Saturday 29th/30th. After this, we’re winding down a bit as this is a very quiet time of the year. In January we’ll be open Friday/Saturday 5th/6th – with a bargain box – and we are planning to close for the rest of the month to allow us to do a bit of reorganisation. However, if you’re passing at any time or want us to open up, please check or email us and we’ll do our best to accommodate you. We’re looking forward to exciting new developments in 2018 which we’ll tell you about soon. Until then may we wish you a very happy time at Christmas and New Year. Let’s hope that 2018 is a good year for us all!